February 2017 – I Made That! I’ve sometimes wondered what exactly is in soap, as well as “soap-free” soap, and also wondered just how necessary they are. Turns out it isn’t hard to make a soap-free alternative for everyday showering out of very simple ingredients. So I tried it out. Please note that this is not some attempt to go “chemical-free” or “all-natural”, though maybe I could agree that it is a little bit anti Big Soap. Mostly, the fewer reasons I have for going to a supermarket the happier I am. But I digress. This was easy, and cheap. I followed a recipe from here which only has four ingredients: Colloidal oatmeal, coconut oil, honey, and the inessential lavender oil. 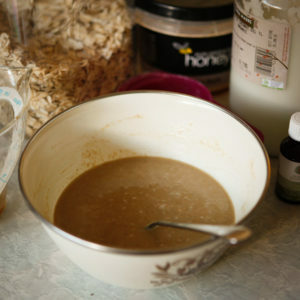 I had the oil, honey and essential oils (well, we had lemon not lavender, but near enough), and we had oats. But what is colloidal oatmeal? Turns out the internet says you can make colloidal oats by just grinding oats as finely as possible, and we just got gifted a very handy op-shop find from Zara’s dad: a grain mill attachment for our Kitchenaid. Awesome. Well, almost. It seems the internet is a little bit misleading. Colloidal oatmeal is oats milled extremely finely, or “micro-fine”, not just an oat flour. But near enough is good enough right? Anyway, after combining the ingredients, I now have a very tasty soap-free soap. I’ve made this seasoning rub a few times previously, so including this as one of my projects feels as if I am cheating slightly. Although, I have been chipping away on some larger projects, so this one was a quick and simple filler project. 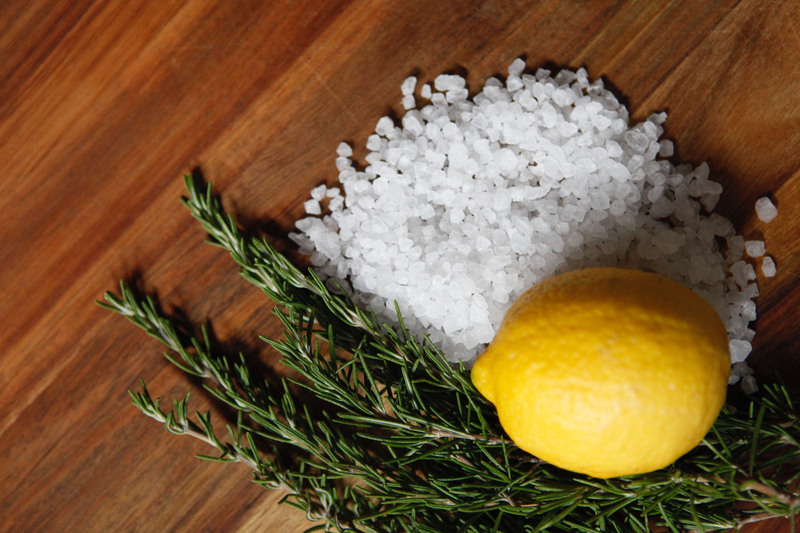 As the name Rosemary and Lemon Salt suggests, it is made from rosemary, lemon and salt. The lemons came from my Aunts property out in the country, I grabbed the rosemary from a bush on the St Georges Road bike path on my ride home one afternoon and we purchased the rock salt at the Food Co-op we’ve started going to. So, in total for 4 cups of seasoning, it cost me 50 cents! To make the salt, it’s a matter of mixing together the lemon zest, finely chopped rosemary leaves and the sea salt (which I partially crushed up in our mortar and pestle). The ratio of ingredients is one cup salt, three tablespoons of finely chopped rosemary and the zest of one lemon. 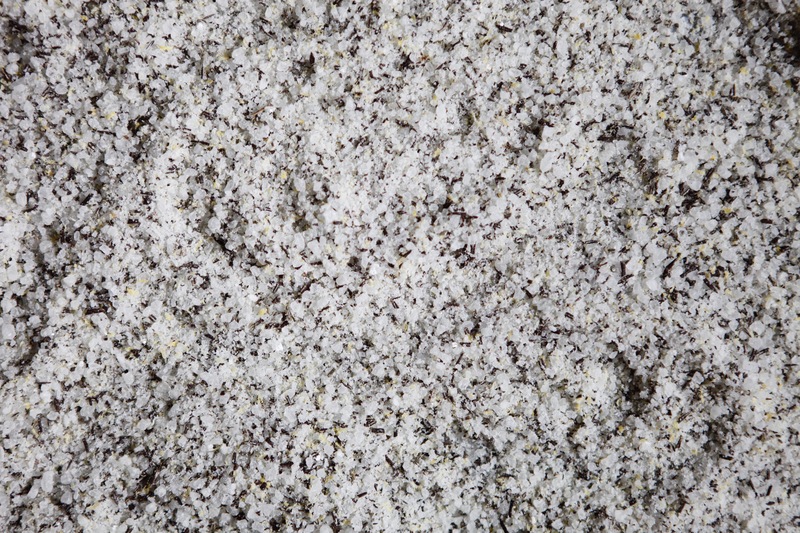 The salt is delicious rubbed onto the skin of a chook before you roast it and any roast vegetable. 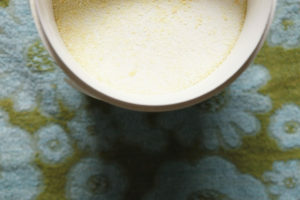 But you really can’t go past tossing your potatoes in olive oil and adding a few generous pinches of this scrummy salt. I do have another secret when it comes to my roast tates, but I’m not willing to give that one away…. Not long after we moved in to our current house I found some mint growing in the back corner of our small garden. Fast forward to today and it now has taken over quite a bit of real-estate, and is continuing to expand. We thought it prudent to utilise some of this fresh mint (which I just researched to find out is spearmint), and decided a mint cordial would be a good way of using some up. 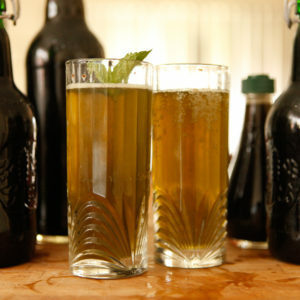 2 cups mint : 1 cup sugar : 1 cup water (the original recipe called for closer to 2:2:1). 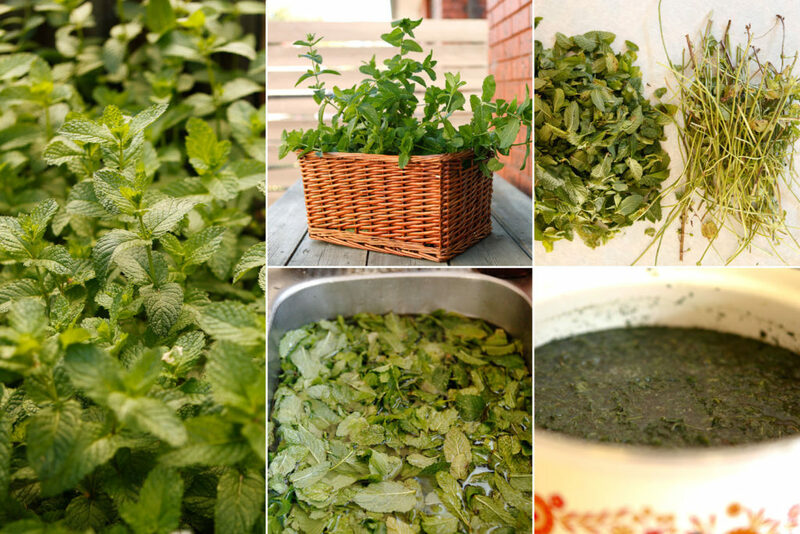 Once finished steeping, strain (or filter with muslin) the mint leaves out then bring the liquid back to a simmer to ensure the sugar is dissolved. 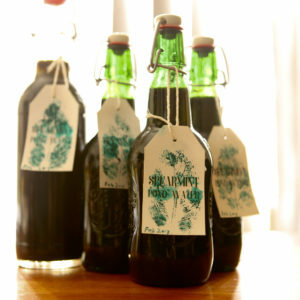 Once all the sugar is dissolved, pour into hot sterilised bottles. Simple. I’m not sure how long it will keep, as information on making shelf stable cordials is surprisingly scarce on the internet. If I make it again I might add lemon juice to decrease the pH which should help it keep longer. I ended up adding some green food dye to swing the colour away from brown towards green, which helped with the visual appearance considerably, but the end result is a dark, brownish, mint syrup with a hint of lolly flavour (I might have cooked my sugar a bit). My murky ‘Spearmint Pond Water’ is quite refreshing with soda water, but as yet untested with bourbon. 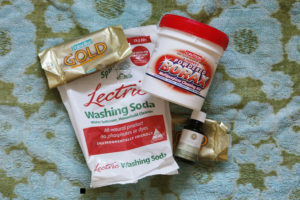 I have often thought that it would be interesting to make my own laundry washing powder and now that I am actively looking for items to make, it seemed like the perfect time. For my recipe, I was pretty lax and just went with the first one that popped up on my Google sear ch. It was 1 cup borax, 1 cup washing soda, a grated bar of organic soap and 20 drops of lemon or lime essential oil (you can view the recipe here). I found the borax and washing soda at an IGA and Simon picked up the essential oils at our local health food store. Rather than buying organic soap, I used soap I had already from a display I did in TAFE when I was studying Visual Merchandising (I had around 10 bars). It was simply a matter of measuring out the items, grating the soap and giving it a mix. I made a double batch, popped the finished product in a plastic container we had lying around, dubbed it Washing POW! 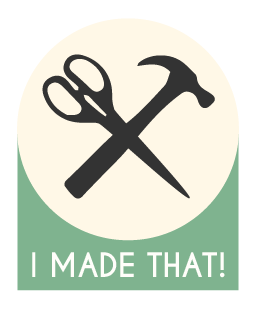 and whipped up a label (cause I’m nerdy like that). I had a few questions around why you would DIY this household product and after going through the process I am now on my way to having some answers. Below are the questions I was contemplating and I’ve gone into a few of the details of my findings. Is it more environmentally friendly? Yes, as you are using ingredients which have less chemicals and nasties in them. However, there are some great healthier options available, including the brand we have been using up to date, Simply Clean. What I really like about this brand was reading the ingredients list and seeing that they have listed what every ingredient does and why it is in included. No, because the two key items you need to use (the borax and washing soda) both come in plastic vessels (one reusable, the other not), although it may be possible to find them at a bulk food store or in alternative packaging. Comparing store bought, you can buy environmentally friendly laundry powder in a cardboard box, made by Aware and it is endorsed by Planet Ark, but the Simply Clean washing powder comes in a reusable plastic bucket. The Aware brand also rates well with Shop Ethical!, a rating system we often refer to assist us in making informed purchasing. Simply Clean is currently not included in the ratings. Do the clothes clean as well? 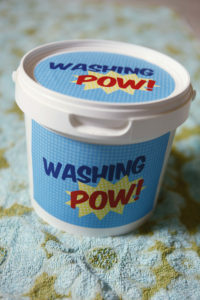 I haven’t tried my Washing POW! However, my bestie gave me some of a batch she made up and neither Simon or I have noticed the difference in the end results. We were using the home made and Simply Clean interchangeably which helped with the comparisons. Other people may notice more of a difference, but for us it was much of a muchness. What are the cost comparisons? My ingredients cost as below (for a double batch), the prices are based on what was used, i.e. I only used half the washing soda so halved the cost. As I used soap I already had, I researched the cost of the soap I used to give a more accurate cost comparison. I made 1.3kg of powder in total, so it came to the cost of $8.01 per kilo of Washing POW! This compares to $10.90 for Simply Clean and $5.59 for Aware.